For those of you who end up listening to my talk, I wanted to share with you, my own personal, “My Life In A Playlist.” The premise of my talk goes a little something like this… If Hollywood were creating a movie of your life, what would be the accompanying soundtrack? These are my top 20 songs, in no particular order, with 2-3 sentences as to why they are important to me. I encourage you to click on the link of each song to give it a listen. Then go to your iTunes files and create your own “My Life In A Playlist.” As I say in my talk, your life consists of a series of events that led you to where you are now. If you’re unsettled with how your life has unfolded, I would encourage you to look back on your life and see if there was something you missed. Maybe a calling that went unanswered. After that, encourage your friends to do the same, then share them with one another. Create conversation. And appreciate the journey. Enjoy! 02. Bossa Nova Baby – Elvis Presley Hello! Johnny Bravo. Elvis. Sort of instrumental in my life. ☺ “Elvis’ Gold Records” was one of our family’s first LP’s. This newly produced version from the “Viva Elvis” show made one of my favorite Elvis tunes one of my... even favoriter! 03. Our Lips Are Sealed – Jane Wiedlin of The Go-Go’s This song reminds me of my family’s annual treks to Disneyland in our tan station wagon. This particular version is fun also because it’s acoustic and I LOVE acoustic versions of songs! 04. An American Dream - The Nitty Gritty Dirt Band & Linda Ronstadt This song reminds of me of my newspaper delivery days. Being driven around in a van by our district manager and being dropped off in the ghettos of Salinas to try and sell newspaper subscriptions door-to-door. It’s where I learned what the sign, “No soliciting” meant. But when we sold enough subscriptions, we got to go on a trip to Disneyland! So the ends justified the means. It’s also a great intro to the “Yacht Rock” genre of music if you’re not a convert already. 05. A Little Respect – Erasure As far as concerts go, I’ve seen Erasure four times and Yaz once. Their common link: Vince Clarke. He also founded Depeche Mode. We became friends when he married the twin sister of one of my old writing partners. 06. Cool Rider – Michelle Pfieffer I believe it was Drew Barrymore in “My Date With Drew” who said, “There are two types of people in the world. Those who love Grease 2 and those who hate it.” Eye heart G2. Which camp are you in? 07. All Shook Up – Suzi Quatro “Happy Days” was one of my favorite TV shows growing up. When I moved to Los Angeles, the first CD that I purchased at the Tower Records on Sunset Blvd was a Japanese import of Suzi Quatro’s Greatest Hits. 08. 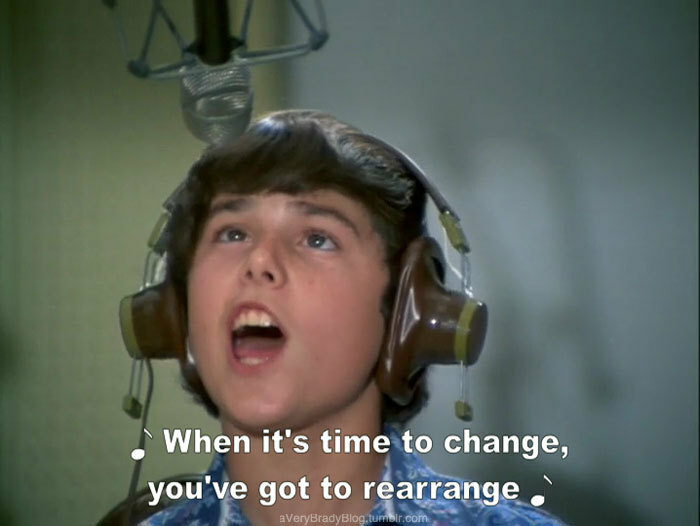 Time To Change - The Brady Bunch Season 5. Episode 1. Adios, Johnny Bravo. “Nuff said. 09. Sweet Caroline - Neil Diamond Besides being the ultimate singalong karaoke selection, this song reminds me of my college days when I pretty much lived off of my father’s gas card and had to sell my CD’s for money. 10. Heavenly - Harry Connick, Jr. Being a romantic at heart, “When Harry Met Sally” became like a relationship guide to my romanticized Hollywood movie life (which, like Hollywood, was empty and based on non-realistic expectations). And with that, came my love and appreciation for the music of Harry Connick Jr. who did the soundtrack. During my choral years, I realized that I was not a soloist, but a blender. So, in college, I was in short-lived, 8 person acapella group so I could fulfill that dream. 11. Send In The Clowns - Frank Sinatra I saw Frank Sinatra sing at the Cerritos Center for the Performing Arts back in the early 90’s. This is one of the few songs he recorded with an introduction (the way he did with every song he performed at the concert) giving Frank’s interpretation and motivation for why he’s singing the song. I also remember walking into my apartment and seeing my roommate sitting on the couch, crying, listening to this song, after he broke up with his girlfriend. 12. Someone You Need - Howard Jones & Duncan Sheik My wife, Mary, has the same birthday as Howard Jones, so she has an affinity for his music. We went and saw his acoustic tour and this song stood out as one that we had never heard but instantly fell in love with. 13. Feels Like Home - Bonnie Raitt But wait! My life wasn’t always about being sad! This song opens up my wedding video. See! Happy! I love this song and the memories that it conjures up because it clearly describes the kind of emotions we felt on our wedding day. And now we work with Don Was, who produced the song! 15. Seasons of Love – The Broadway Cast of “Rent” I grew up listening to movie versions of Broadway soundtracks because I lived in Salinas, CA and didn’t have access, or money, to see a Broadway show. When I got to college, I got a May Co. credit card because they had a little known Ticketmaster booth in the basement of the store. I would frequent there often to get tickets to everything I could run up my credit to see. 16. My Shot - Lin-Manuel Miranda Lin-Manuel Miranda is amazing. ‘Nuff said. Okay, I can say a little bit more. My daughter introduced me to the music of “Hamilton.” As my kids were growing up, I often tried to influence their musical tastes by curating the music in our car or at home. This was the first time the roles were reversed and I actually ended up LOOOOVING her recommendation. 17. Come Thou Fount Of Every Blessing - Sufjan Stevens Besides being an awesome hymn, this song was used in one of my most favoritest TV shows of all time, “Friday Night Lights.” Season 4, Episode 1, at the end of a game (which they eventually forfeit) when Coach Taylor walks to each injured football player in the locker room. So good. 18. It's Such A Good Feeling - Mr. Rogers When I was in Kindergarten, school got out at 11:30 AM. After which, I would walk several blocks home alone, and wait on the front lawn until about 12 or 12:30 for my dad to come home and let me into the house to give me lunch. After we ate, he would sit me in front of the TV and he would go back to work. I was supposed to wait until my brothers got home around 3. But until then, I would watch PBS which consisted of Mister Roger’s Neighborhood, Villa Allegre, and Reading Rainbow. When I was in college, I wrote a letter to Mr. Rogers thanking him for helping watch me after school during that time and he wrote me back a personal letter along with a signed photo that I have on my desk at work. 19. A Little Less Conversation (Live) - Mac Davis Mac Davis sang this song (which he wrote for Elvis) when he came in to record an episode of Johnny Bravo. This version contains the original lyrics that he wrote for Aretha Franklin. 20. Ripple - The Grateful Dead I consider the TV show “Freaks And Geeks” my number one most favorite TV show of all time. The producers used this song to end the entire series. The show inspires me to tell my most embarrassing stories because they’re one of the best ways to relate to others and connect. Have you ever pondered, "I wonder if they ever took a picture of all the people who created the 52 original shorts for the 'What a Cartoon!' show on Cartoon Network?" Well, if that's you, (and it probably is since you're still reading this) then keep scrolling down to find out! The picture was taken (and Photoshopped) for the premiere of the second batch of 52 shorts that took place at the Academy Of TV Arts And Sciences back in 1995. As you probably know, before a show premieres on television, the publicity department of the network usually promotes said show through print and visual media, hoping to get people to tune in and watch. Back in the day, the publicity department at Hanna Barbera would either pull visuals from the show's model sheets, use an animation cel set-up from the show, or (for better or worse) put something together without consultation or approval from the production artists. 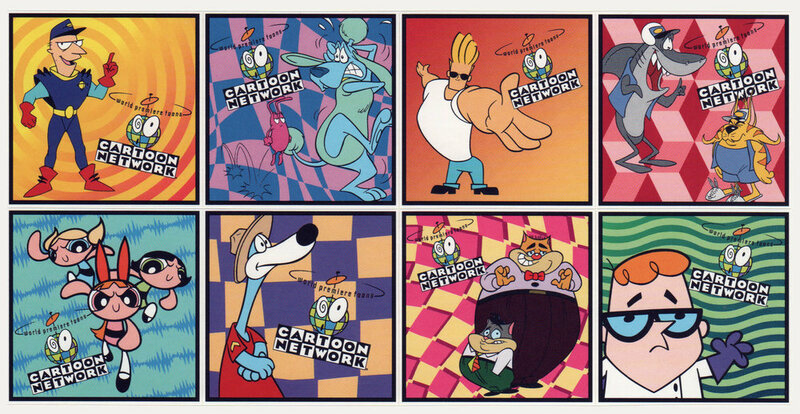 Below is a set of stickers used to promote the show where the network slapped pre-existing art on a generic background. Not offensive and gets the job done, but when this happens, there are often tiny details that get overlooked. Like giving Johnny a white t-shirt. Or using early artwork for the Powerpuff Girls that are completely off model. Fortunately, we did get to participate in creating some original art to promote the show. For example, the publicity department asked Pat (George and Junior) Ventura, Craig (Powerpuff Girls) McCracken, Genndy (Dexters Laboratory) Tartakovsky, and myself to create original art for a set of stickers. We even got to draw a mash-up for the side of a Fruity Pebbles box! And in a more inclusive bit of promotion, they had the in-studio artists working on the show draw caricatures of themselves for an article in Animation Magazine. Ultimately, it's all good. It gets people talking and brings awareness to potential viewers. And most people often see these things and forget all the details that we, as creators, cringe over. That is, until someone on the internet (like me) shares them again and points them out. As I write this, it will officially be 20 years to the day that Johnny Bravo premiered on the Cartoon Network! Yay! (insert virtual confetti throwing here) As you can see below, it was ranked as number 2 of "5 Funny New Things on Cable." When I was in the middle of producing the first season, I hit a bump when I mistakenly forgot to add a piece of dialogue into the episode, "The Sensitive Male" during the final mix. One of the animation producers at Hanna Barbera gave me some old school advice by telling me, "Don't worry. It's just a cartoon. It's for kids. They'll watch it once, maybe twice, then go on with their life. It's not the end of the world." Mind you, the internet was in its infancy, DVD's were on the horizon, and the Cartoon Network was only available in a few million households. Needless to say, his advice was right for the time, but ultimately off base. Since then, I've received wonderful letters from children all over the world expressing their love for the show and drawing cute pictures of Johnny. I've had the opportunity to hear wonderful stories from people who grew up watching the show, not just here in the states, but around the world. From India to Portugal, Australia to Switzerland, I've heard Johnny speak in different languages (it's fun to hear the Japanese interpretation of a southern Elvis drawl). I had a man come tell me that Johnny Bravo was the only show he used to watch with his father because it was the only show that made his dad laugh. Another woman told me it was the favorite show of her autistic daughter who couldn't get enough of Johnny's voice (shout out to Jeff Bennett!). Right now, I'm directing on the upcoming series for Amazon, "Pete The Cat," which is being produced by Swampy Marsh (the co-creator of Phineas And Ferb) and based on the best selling children's books by James Dean. So I'm still making cartoons. And for that, I'm grateful. And if you're reading this, thank you for being a part of this amazing journey. I hope to continue making you feel joy through my work for years to come. It's from an actual night club (which I believe is closed now) located in Seoul, South Korea. I paid a visit there in 1996 with my producer, Kara Vallow and our overseas director, Bob Arkwright. FUN FACT: The owners of the club thought that Bob was actually Chris Slade (the drummer for AC/DC) and insisted that he visit them the following night to perform with their house band. As much as we tried to convince them of the truth, they persisted in their belief and wouldn't believe anything we were saying. So to preserve their dignity, we caved and went along with the charade, telling them that Bob would stop by later that week to jam with them. Of course he didn't. So if you're reading this, and you're one of the former owners of the Rock Me Amadeus club in the area of It'aewon in Seoul, Korea, now you know. And knowing is growing. So. Now that you're all indoctrinated in the cult of Falco, I hope it helps you understand why the 80's were such a fun time in music history and why I tended to hire certain 80's artists to sing on Johnny Bravo. For example, if you click here, you can visit my Johnny Bravo Facebook page and, under the videos section, see a rare behind-the-scenes clip of Rick (Jessie's Girl) Springfield and Maureen (Marcia Brady) McCormick performing a duet in the sound booth at Hanna Barbera from our first season episode, "Beach Blanket Bravo." Besides Rick, we also had Billy Vera of Billy Vera and The Beaters voice a land shark in that episode. Also in the first season, we had the pleasure of having Chuck D from Public Enemy and Montell (This Is How We Do It) Jordan do voices in our episode, "Hip Hop Flop." Mind you, not everybody was clamoring to work on our show. We got a lot of responses like, "We respectfully decline" and "Unfortunately, we have a scheduling conflict." which is code for "Yeah, right!" But even with the Debbie Downer agents, we still got a number of folks to come out and play in our sandbox which made the pimply-faced kid in me all giddy. In our fifth season, we got a little bit more 80's flava when we hired Jimi Jameson of Survivor to sing an "Eye of The Tiger" parody during a training session with Mr. T in the episode "T is For Trouble." We even got Sebastian Bach to perform a little ditty in our episode, "Johnny Makeover." Both guys were fun to work with, but unfortunately we had to do a phone patch from another studio as neither of them were in Los Angeles when we needed them to record. I remember debating with our writer, Craig Lewis and our producer, Diana Ritchey about which song we wanted Jimi Jameson to sing on cue to prove he was who he said he was. I think we settled on a few bars of "High On You." We weren't disappointed. As I wrote in my last post, "Funky Fun Thing # 8," we created an episode that was a pseudo musical send-up of "Grease" and various 80's teen films. But in that post, I didn't really elaborate on the process we went through to create the episode and its soundtrack. For example, the lead girl, Sandy, was designed by Vaughn Tada and Dan Haskett. To give authenticity to the era, she was dressed to look a bit like Molly Ringwald while all the guys had swishy hair and, like Johnny's nemesis below, wore colorful wrestling pants. And as the pièces de résistance, we hired Vince (Depeche Mode, Yaz, Erasure) Clarke to complete the full 80's immersion. The first song in the show was a take on “Da-Doo” from “Little Shop of Horrors” but interpreted with the music stylings Vince originally used on “Only You” by Yaz. The second song we did ended up being a take on the stylings of “Just Can’t Get Enough.” And if that weren't enough, we got an even bigger treat when we got Richard Butler, the lead singer of The Psychedelic Furs, to record said last song. Our working relationship consisted of me coming up with the words and images I wanted to convey for the song, Vince creating music and lyrics, me making changes (barely any! ), and then him doing a final mix. As we created original musical cues to play throughout the show, Vince had me name songs that best conveyed the mood I wanted to set for the scenes. Then I just sat tight and waited for him to do his magical musical thing. I remember that it was like Christmas every time I got an email from him with a new track. So if you listen carefully to the background music, we took inspiration from songs by artists like Human League, Howard Jones, OMD, Spandau Ballet, ABC, and the reason why I'm writing this blog, Falco. I wrote the following article in October of 2000 for a zine called Apatoons. It’s just my musings on the late Ed Benedict. He also worked on my two other Johnny Bravo Specials after I wrote this article. When I started Johnny Bravo I wanted to develop a classic Hanna-Barbera style for the show. Not the '70's or '80's "Push it through, it looks good enough" style that the studio was accustomed to, but the very stylized and minimal look that I found appealing. The one that was developed for Ruff and Ready and Yogi Bear. I asked my producer, Byron Vaughns, who we could talk to and he mentioned Ed Benedict. I pessimistically thought, "Yeah, right! Like, Ed Benedict would come out of retirement to design my show." Byron said, "Hey, it's worth a shot." From there, I decided to do some homework on Ed Benedict. I knew that he designed all the major H-B characters but that was about it. Surprisingly, when I asked people around the studio about him, they questioned my wanting to approach Ed Benedict for anything. I was told by several artists and production people that he was a crabby old man who doesn't like to be bothered. They said that he was difficult to deal with and that if I wanted to learn about his artwork that I should just watch the cartoons he worked on and study his model sheets. It was interesting because all these comments came from people who hadn't really dealt with Ed on a one-on-one basis. The only one who could really say anything about him from first-hand experience was Joe Barbera, and he told me that he's the main man to go to if I can get him. Fortunately for me, the Animation Art department was still in the studio and they had recently dealt with Ed. I knew that they could give me the real answers about the Ed Benedict of today. Mike Ryan, the head of the department, told me that all the stories I've heard about him are true. Ed is a crabby old man who left Hollywood because he hates it. But he also told me that he likes when people visit him and that he still knows how to work a pencil. Then he showed me some of the line art that Ed had recently drawn for them. I was amazed at how clear the composition was and impressed that his linework was the same as it was all those years ago. I had recently gotten a drawing from Joe Barbera and noticed that there was a slight deterioration in his drawing skills. Since they were both in their late eighties, I assumed Ed had also lost a bit of his craftsmanship, but apparently it was still there. From that point on, I was determined to use Ed Benedict and all the rest of the old school H-B guys in one way or another on my show. Meanwhile, Byron had gotten Ed on the phone. It seems that Ed gave up working in animation because he didn't need the money or the stresses of deadlines. Besides that, he's retired! Fortunately for us, from Byron's conversation, Ed agreed to talk to me and my designers, Miles Thompson and Julian Chaney, about the art of animation. Over the course of a couple of weeks, Ed would call us up and discuss animation but, in his words, "it's like trying to tell you about a pretty girl. No matter how much you describe her, you'll never know how stunning she is until you can actually see her." That prompted me to ask our head of production, Sherry Gunther, to pay for me and one of my designers to fly up and see Ed for a drawing lesson. It was a long shot, but it worked. The next thing I knew, Julian Chaney and I were flying up to Carmel to spend a day with Ed Benedict. We arrived at his home and were kindly met by him and his wife, Alice. Entering into his kitchen, I saw my first bits of Ed Benedict artwork. He had created about twelve different rabbit sculptures, all made from different things from wood and clay, to paper clips and rocks. Alice told us that he made one every year for Easter. Next he took us past his retro looking family room to his back room working space. As we complimented him on his home decor, he proudly said, "Notice how I don't have any animation artwork on my walls except for this drawing." He then pointed to a framed drawing of Betty Boop given to him by Grim Natwick. "Now he was a good man and a great artist." From there, Ed told us that he didn't understand why we kept asking him if he could help us figure out the "Ed Benedict" style. To him, there was no "Ed Benedict" style so it urked him that we even made a comment like that. He then proceeded to pull out his sketchbooks from the 1930's. (That right there was worth the trip.) He showed us all the different things he liked to doodle and explained how he doesn't like to dictate the way his art comes about. He also talked of how he dreamed of being a set designer and showed us sketches of sets on the MGM lot that he did during his breaks. He also had landscape paintings, caricatures, horticultural and architectural studies, and most of all, studies discerning composition of shapes within space. From there, he began to draw with that concept in mind. We were there for hours as he took our development drawings and transformed them into works of art. It was a once in a lifetime thing to have Ed Benedict talk in abstracts and then watching these concepts flow from his pencil. The worst part about it was that he kept drawing over everything he did and then ripped it up when he was finished. By the end of the day, I had grown an appreciation for the art of animation. I had learned more in those couple of hours than I ever had before or since. I had also made a new friend and mentor on my journey through the world of animation. After that meeting, Ed agreed to do some conceptual design for my show. As long as he didn't have a deadline. He also made it a point to let us know that he wasn't doing it for the money because he didn't need it. I like to think he did it because of the camaraderie between the two of us. Each delivery he made was like getting a Christmas present in the mail. I remember looking forward to his deliveries and the follow up calls to discuss why he did what he did. I felt like the luckiest kid in school because I got one of the greatest animation legends to come out of retirement to work on my production. It was a dream come true. One of the funnest things about visiting Ed was going through his personal file cabinet of every single piece of artwork he's ever done. He kept all his drawings because people kept asking him for the same designs for animals and people over and over. Knowing full well that he hates having people copy his stuff, I was pleasantly surprised when he allowed me to take selected files of his original artwork to Kinko's and photocopy them for reference purposes. The best part was that he allowed me to make beautiful color copies of his development artwork from "Invitation to the Dance" and "Dixieland Droopy." All that he asked was that I not make any more copies of his material for other people to steal. I can now look at his artwork and study it in ways I could never have without Ed's thoughts and words. I went and visited him by myself two other times during the course of my show and about three or four times socially after that. Each time I went, I tried to spend a full day with him. Each time I learned a little bit more about Ed as an artist and as a person. He has a deep love and passion for the art of animation and is saddened and angry of its demise since the golden age. He sketches with a pencil that is not in existence anymore. He loves drawing Vegas showgirls. He doesn't think Pebbles is designed to go with the rest of the Flinstone family (he didn't do that design). He holds his pencil between his third and fourth finger. He loves classic Disney and UPA cartoons. He started Disney the same day as Fred Moore. He likes chocolate chip cookies. He only takes two or three puffs from his cigarettes. In between his cigarettes, he takes the gum out of his mouth, places it on a toothpick, and then puts it back in his mouth after he's done smoking. He's a pack rat. He loves to tinker on his organ and plays it every night before he goes to bed. He doesn't like to be bothered until after 11:30 in the morning and behind all his crabbiness is a person who just likes what he likes and doesn't give a damn about what anybody else thinks. On one particular visit to Ed’s home, I was leafing through a stack of old drawings he had done. Somewhere in the middle of the stack, Ed had me stop on a specific drawing. It was a sketch he had done on an old magazine page. I looked at it with the artist’s eye that Ed had taught me to use and was ready to tell him what I saw. I was ready to give him a compliment on his use of positive and negative space. I was ready to comment on his use of straights versus curves. I was ready to show him that all the things he had shared with me had sunk in. “You see that drawing?” he asked. I freely admit that I am a lover of musicals. Even in Junior High and High School, when it was odd for a guy to love "The Sound Of Music", I lived my life like a Broadway trope, singing wherever I could and dancing to the inner beats in my head. It's the reason I joined the church choir and the local community show-pop-jazz group, "The Steinbeck Singers Unlimited" (which is a whole other post in and of itself). In fact, when I first moved down to Los Angeles, I made it a point to visit two distinct "Grease" sets: the drive-in theater (where I sang "Sandy" while swinging on the swing set) and Venice High School where the majority of the exteriors were filmed. "Tell me more, tell me more... Where'd you get those fluorescent shorts?" Johnny definitely carried the Danny Zuko torch with his stereotypical macho personality which overshadows the fact that, at their core, they're both loyal and good natured. As you might imagine, it was an ongoing goal of mine to figure out how to do an homage to "Grease" in our show. It took a while but, by the time we got to our fifth season, I finally figured out how to accomplish this goal. My big idea was to have Little Suzy find Johnny's old yearbook and discover that Johnny was "a ninety-eight pound weakling" in high school. From there, the episode would be about how Johnny became buffed to win the hand of his high school crush through a flashback story set to 80's music (not 50's music because we didn't want to make him that old!). I had to do a number of rewrites to the outline because the network was worried that the episode was going to be too serious. After all, the show was about high school heartbreak and unrequited love. What's not funny about that? FUN FACT: The Doo Wop Singers for the episode were Cat Cavadini, Tara Strong, and Lea Salonga. Yes! That's right! The Filipino Tony Award winning actress, Lea Salonga! She did an amazing job harmonizing with Blossom and Bubbles as sort of the fourth "unofficial" Powerpuff Girl. Did I mention that Tom (Biff Tanner) Wilson was also there? (What?! Mic drop!) It truly was a pleasure to be at this record. If you scroll back to my "Number 3 Funky Cool Thing" you can see the cast photo. So for all you folks whose names are signed "Boogedy boogedy boogedy boogedy Shooby doo-wop she-bop," enjoy this cruise down memory lane. Trying to flip the channel to these animated music videos was a common practice of mine until the mid-80's when they slowly started swapping the shorts with bumpers featuring the hit boy band, Menudo. By 1985, they put the final nail in the coffin and stopped showing Schoolhouse Rock altogether, replacing them with exercise shorts starring Mary Lou Retton. I never thought about recording the SR shorts (because they were supposed to go on forever! ), so when they stopped showing them, I, along with the rest of the world, were left with the memories of the songs stuck in our heads. That is, until these cheesy (yet entertaining) videos were released on VHS! Mind you, the original shorts were intact and brilliant in these collections. The problem was, as the series musical director, Bob Dorough said, "The quality is poor and there is also some new, inappropriate and inferior material not written by me and more or-less sung by Cloris Leachman and some kids." So what does this have to do with "Johnny Bravo?" Everything! It was inspirational and educational on so many levels for a budding animation geek. Besides the fact that I can recite the preamble of the Constitution, it helped me hone my timing skills and foster my love of music put to animation. To make the show even more authentic, we hired the legendary jazz artist, Jack Sheldon, the original singer of "Conjunction Junction" and "I'm Just A Bill" to voice the Sensitive Male. Unfortunately, (well, fortunately too) it wasn't until 2002 that we were able to bring the team back together to record an episode for the final season of Johnny Bravo. Entitled, "Traffic Troubles," Johnny goes to Musical Comedy Traffic School in hopes of meeting some high kicking musical comedy chicks. Instead, he gets a lesson a la Schoolhouse Rock from the Sensitive Male. It was the first time and only time we had Seth come back to the show, but this time as a voice artist instead of a writer. We even reprised his song, "Manners," but changed the lyrics to be about taking your driver's license test. The other fun thing about the episode was reconnecting with Jack Sheldon again. To bring everything full circle, he even agreed to be the house band at our final cast party where he brought along his trio. My guess is that my parents bought the album for me after my first trip to Disneyland in 1973. That's me in middle with the golden vest. If you're just joining my blog, this list is about seemingly ordinary objects that have special significance to my career in animation. So it goes without saying that this Disneyland album was one of the many inspirations for me as a child. I listened to this album ad nauseam while staring at the simple, yet intricate, designs of Mary Blair on the cover. It fed by cartoon obsession when it wasn't Saturday morning. The thing that I didn't expect was that I would one day sing for the man who directed this amazing album: Paul Salamunovich. As noted in "The Hollywood Reporter:"
He conducted choral music on the scores for more than 100 films and TV projects, including Francis Ford Coppola’s The Godfather (1972) and Bram Stoker's Dracula (1992). His work also can be heard on Flatliners (1990), First Knight (1995), Air Force One (1997), A.I. Artificial Intelligence(2001), The Sum of All Fears (2002), Peter Pan (2003), Angels and Demons (2009), and on the NBC drama ER. Salamunovich sang on the soundtracks of such films as Judgment at Nuremberg (1961), How the West Was Won (1962) and The Trouble With Angels (1966). His musical contributions spanned the spectrum from classical, pop, and jazz to folk and new age music with such diverse artists as Stan Kenton, Liz Story and Cirque de Soleil. Salamunovich guest-conducted throughout the world and prepared choirs for such notable conductors as Igor Stravinsky, Robert Shaw, Bruno Walter, Eugene Ormandy, Alfred Wallenstein, Georg Solti, Zubin Mehta, Carlo Maria Giulini, Valery Gergiev, and Simon Rattle. But even though he was a world renowned maestro, I was first introduced to him as Paul Salamunovich: choir director for Loyola Marymount University. For me, animation is all about timing. Having said that, music is an integral part of understanding timing. You need to understand the life that's in music if you want to bring life into any character. It's like finding the heart in a performance. It's an intangible that you need to experience in order to find. Animation is often about taking your drawings and creating moments. There's a certain rhythm to life and, if you miss it, you miss the moment. In fact, Chuck Jones often used musical bar sheets to time out his animation. Through studying music under Paul, I also learned the subtleties of interpretation. In 1990, we were one of four men's choirs invited from the United States to participate in The Pacific International Festival of Male Choirs in Vancouver. It was an international festival where some of the greatest choirs in the world gathered to perform. I'm in the 3rd row, fourth from the left. Before we went onstage, we sat backstage and listened to another choir perform "The Battle Hymn Of The Republic." It was the exact same arrangement we were planning to perform, but you could tell there was a definite difference in interpretation of the text. The tempo was slightly slower, the intensity of the singers wasn't evident, and the richness in their sound wasn't very deep. I don't say that to be pompous (God knows that our choir wasn't great because of my singing), but because Paul knew how to interpret music on a page. *Credit also has to be given to our pianist, the legendary Bob Hunter. The above arrangement was so complicated that the other choir had to bring in a second accompanist to handle it. Bob did it all by himself. Through the LMU choirs, I learned how to listen. I mean really listen. There's subtleties in balance, tone, and pitch that I never would have discovered had it not been for my choral training. By showing me when to breathe and why, how to phrase a sentence, how to dramatically tell a story, and the importance of balance in a group's dynamics, Paul taught me how to go from being a kid to becoming a world class performer. Obviously, it took some time getting there. Working at Hanna Barbera in the pre-digital world was like a dream come true because they had all their original artwork onsite! I created the piece above by using the original model sheets, xeroxing them onto a cel, and borrowing a paint station in the Ink and Paint department (after hours of course!). I later got it signed by Bill Hanna, Joe Barbera, Don Messick (the voice of Scooby Doo), and Casey Kasem (the voice of Shaggy). It's basically a stock pose of Scooby and Shaggy superimposed in front of an image of the Mystery Machine. Yes, the Mystery Machine. Mystery Inc.'s signature mode of transportation. Even Batman loves the Mystery Machine! Animation Art had a real life Mystery Machine (which was awesome!) custom made for signings and appearances to draw crowds. There was a bit of grumbling from some of the artists when they unveiled it because it wasn't made from a vintage Ford, VW, or Corvair van, but I didn't care. It was the Mystery Machine! It was so cool driving in to work every day and seeing it in the parking lot. So when we were producing interstitials for "Johnny Bravo" I, of course, asked to do my interview inside, where else...? One time, back in 1997, Butch Hartman, Seth MacFarlane, and I got permission to bring the van out to Glendale for a school visit with Mae Whitman and her elementary school class. The interesting part was, when we pulled into the school parking lot, we were followed in by a police car! (You would think they would be in front of us as escorts, but fat chance there!) As a hoard of kids ran up to the chain link fence to see all the commotion, we started to stress out about the ramifications of getting a ticket in a vehicle we didn't own. When the officers pulled up beside us, I asked, "Is there anything wrong, officers?" One of them nonchalantly answered, "Nah. We just wanted to see if Shaggy was in the back." Seth and I grabbing some Carl's Jr. after the school visit. In 2003, I was able to use the Mystery Machine one last time during our wrap party for the fifth season. We had them drive the van out to Loyola Marymount University where we parked it out in the middle of their Sunken Gardens and used it as a photo op. "Seriously. Why rent a photo booth?" The Mystery Machine is a definite crowd pleaser and Warner Brothers often uses it when there's something eventful going on. For example, here's a pic of Jay Bastian (the head of development for Warner Brothers) and I during the unveiling of the Hanna Barbera relief statue at the Academy Of Television Arts and Sciences in 2005. So it's fair to say that I've taken my share of pictures with Mystery Inc.'s mobile of choice. There are several vans now. Most of them created specifically for the live action movies. One of them is on permanent display at the Warner Brothers Studio Lot so now everyone can take a picture with it! Scooby Doo is now a Warner Brothers property and is a part of their lineup as you can see by the WB mural on the corner of Olive and Pass Avenue. Besides being a big fan of Scooby Doo, I'm mentioning it because I did an on-camera interview for the DVD featurette, "Scooby-Doo The Whole World Loves You" which, according to Amazon.com, "focuses on Scooby's continued popularity and fans continued love of the character. Features interviews with various writers, directors and actors who have worked on Scooby TV and Movie projects over the last 40 years. (20 mins)" For me, it was a tremendous honor to be a part of it because I'm such a huge fan. I can't really say I'm the "ultimate" fan because I don't dress like anybody from the show and I haven't named my kids Velma or Fred. But I have been known to say "Jinkies!" so I got that going for me. For the DVD, I mostly talked about my work on our "Bravo Dooby Doo" episode and Mr. Barbera's involvement in the show. The most random anecdote about my interview is that I wore a shirt with green stripes for the interview. Why is that interesting, you ask? Well, whenever they do these interviews, they do them in front of a green screen so they can lay down whatever images they want to in the background by altering anything that's green on camera. (I don't want to go into too much technical details when we have Wikipedia for that.) Anyhow, I ended up changing shirts with one of the crew members who happened to be my size. It was just another reminder of why it's important to shower before you leave the house. So, if you're watching the featurette and thinking, "Man, that Van sure is a fancy dresser," then I apologize for misleading you into thinking I'm so fancy. That was really the only anecdote I have from the recording session. Besides the fact that they put some man makeup on me before the shoot. At least that's what they said it was. David St. Hubbins: Yeah, and clever. I was there with my friends from college to see the world's loudest Rock N' Roll Band on their "Break Like The Wind" Tour. I remember sitting in the balcony (We were in college! They were the best seats we could afford!) and watching Rob Reiner walk in from the back of the audience as all heads turned towards him and chanted, "Meathead, Meathead, Meathead..." My favorite moment (among many) came when Nigel was introducing the next song and yelled into the microphone, "The sun never sweats! Look it up!" It was super cool because his monologue randomly came to him without any prompts. But as awesome as it was to get him to record a bit for my answering machine, there was more to the story than that. Michael was actually at the studios to record the part of King Raymond for my "What A Cartoon" short, "Jungleboy." Below is the "Awkward Family Photo" cast recording we did after the session. Prior to this recording, I had done "Johnny Bravo And The Amazon Women" with one David L. Lander (A.K.A Squiggy from "Laverne And Shirley"). At that time, David was talking to me about a CD-ROM that he and Michael had been working on and like a fanboy, I told him, "You know, if you ever do anything with Lenny and Squiggy, I would be more than happy to do anything just to be a part of it!" FUN FACT: On the above album, "Lenny And Squiggy present Lenny And The Squigtones," the guitar work was done by Christopher Guest who was credited as Nigel Tufnel, the character he played on "This Is Spinal Tap." In that initial meeting with David and Michael, my then writing partner, Jason Rote, and I pitched them an animated idea for a "Lenny & Squiggy" movie. Both of them were on board to do something with the idea and still are today. Unfortunately, because our schedules have been so all over the place, the project has somehow taken a back seat to other things going on in our lives. But once they agreed and trusted us with the characters, we had several meetings where David and Michael basically taught us everything there is to know about Lenny and Squiggy and schooled us on the art of being stupid. It was like a master class in improv (which makes me so glad we recorded those sessions!). Over the years, I've had other story sessions with the two of them, we've developed a script, we've gone into a recording studio and laid tracks, and even got character designs and an animatic. It's been a long process, but we hope to someday take it out and get it made. The neatest thing about this project has been the friendship I've struck up with David. As many of you may know, David has multiple sclerosis and has been a spokesperson and advocate for finding a cure since he went public with the fact in 1999. Knowing what I know, I see him as a remarkable and strong human being who can't help but create comedy amidst his situation. In my time with him, he's shared some amazing stories about his time as a kid growing up on the east coast and watching live theater in it's hey-day, not to mention his time with The Credibility Gap. For me, it's fun to hear him talk about baseball because, if I remember correctly, he said that if he never went into acting, he would've loved to be a baseball announcer (which he got to do in "A League Of Their Own."). So it made me happy to know that, for a while, he was a scout for the Anaheim Angels and later the Seattle Mariners. ACT LIKE YOU'RE DOING RESEARCH.